In the year 1900 Africa was the world's most sparsely populated continent. Today, it boasts a seventh of the world's total population. While most people have only been pre-occupied with Africa's failure to develop like Western and many eastern countries have done, they've missed what is happening on the continent. Over 800 million people have been added to Africa's population in the past century. What's even more significant is these people are moving to big African cities. Six of the ten countries with the highest rates of urbanisation in the world are in Africa. When people move to the city from rural areas, they need homes, water and electricity. This spurs on growth in infrastructure. In fact, Africa requires R100 billion per year over the next decade for infrastructure investments. This investment is needed to kick-start large-scale economic growth. But the real kicker is 40% of this investment will go towards the development of renewable energy infrastructure. And there are great profit opportunities available, if you know where to look. According to the Global Trends in Renewable Energy Investment report, new installations of carbon-free renewable power plants in 2014 surpassed 100,000 megawatts of capacity for the first time. Renewables such as wind, solar and biomass generated an estimated 9.1% of the world’s electricity in 2014, up from 8.5% in 2013. Investors are also getting a piece of the action. In 2014, investments in energy rose 17% surging to $270 billion. In developing countries, where renewables are best positioned to address the chronic lack of energy access, clean energy investment rose 36% to $131 billion. And in South Africa alone, renewable energy has attracted investment of R192.6bn, 28% (R53.2bn) in foreign investment. 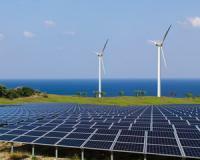 Investment in renewables grew 20,500% between 2011 and 2012. An energy deficit has effectively stunted Africa’s development, with an estimated 70% of people in sub-Saharan Africa alone, without reliable access to electricity. All in all, there are about 600 million people in African without access to reliable electricity. So the demand for reliable energy infrastructure will increase. If you take a look at the last five years, the green energy footprint in Africa and South Africa was minuscule. Now more than 2,000 megawatts is coming from 42 projects which have been installed across South Africa – and there is more to come. In fact, the South African Department of Energy has already committed to 13,225MW of renewable energy generation by 2025. The South African Government brazenly committed to reduce its carbon emissions by as much as 42% by 2025. Whether this becomes a reality is another question, but the point is, our government HAS to reduce carbon emissions. This allows companies who offer renewable energy infrastructure to get involved and make a profit. What if I told you, I’ve pinpointed one company that offers you everything you need in a single share and if you decide to buy this stock today you’ll also be getting it at a handsome discount to its six competitors, which makes it an even more attractive buy, right now. To get the full report on this share, I’ve reserved you a no obligation free trial of my brand new Real Wealth report right here. The construction of these renewable energy projects will be to the tune of billions of rands. And there’s one company I know will benefit. This company made R1.28 billion from renewable energy and electricity projects in 2012. Then in 2013 it upped its revenue in this sector to R1.727 billion. And in 2014 revenue grew to R2.236 billion with a massive R2,951 billion to end off 2015. The company released interim results on 19 April 2016 and these showed yet another increase of 28% in revenue, with its order book increasing to R5 billion worth of future projects compared to R3.7 billion a year ago. So clearly it’s tapped into the demand for construction in the renewable energy sector VERY WELL. This is a small, but extremely fast growing company and if you’d like to discover more on why I think this stock is a guaranteed winner, then you check all my analysis in my Real Wealth newsletter. P.S. To discover three other potential winning stocks, then I urge you to check out my Real Wealth newsletter – you stand the chance to potentially return 269% in 3 years’ from these gems.